Welcome to the official website of Maigan Lynn! Welcome to the Bubble!!! Here you will be able to find an online gallery and store, licencing information, upcoming events, newest art pieces, links, and any and all things related to the Fantasy Art of Maigan Lynn! Check back regularly for updates and don't forget to become a fan of Maigan Lynn on Facebook - now and again there are giveaways with some really cool prizes! Thanks for stopping by and enjoy your time in the Bubble! ​The Shop is currently under construction! 'It's true, the shop is currently under construction. BUT -it's actually a very good thing because i"m in the process of overhauling it COMPLETELY! It will be much more user friendly than the previous shop, simple layout, simple menu's, and super speedy checkout! It's taking me a little time to upload everything properly but I promise you it'll be worth it! Thank you so much for your patience. In the meantime, take a gander around the site and check out what's new! Lots of really cool stuff on the horizon!!! Come check out my new YouTube Channel! Weeeee! Ok, so I FINALLY bit the bullet and created a YouTube channel where I show how I do my poured paintings but I also now offer tutorials! For anyone who has subscribed I want to THANK YOU for being a part of this adventure and making this possible! I am blown away and completely in shock to say I now have over 7000 subscribers! This is amazing and I am so thankful and grateful that this channel has done so well! THANK YOU! My newest paintings, "Sirena Vampira" and "The Hypnotist"
Two of my newest paintings were both created for auctions over at The Rabbit Hole Artist Collective over on Facebook. "Sirena Vampira" was created for Octobers theme, Creatures of the Night, and "The Hypnotist" has been created for this months theme, Black and White, that starts on November 24th. You can purchase the original painting for "Sirena Vampira" as well as prints through my Etsy shop and you can come RSVP to our auction on Facebook to have your chance to bid/buy "The Hypnotist". 2014 brings with it some surprisingly BIG news for me! I'm part of this amazing project - something I could have only dreamed of becoming a part of! It's called 78 Tarot and it's a tarot deck collaboration of 78 of the most amazing artists, including me! PINCH ME! And when I say AMAZING, I'm not kidding! 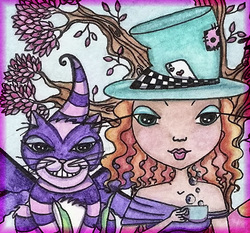 The artists include Jasmine Becket-Griffith, Larry Elmore, Meredith Dillman, Tiffany Toland-Scott, just to name a few! This project is SO big and SO exciting that i'm going to be adding a tab to the top of my page for all things 78 Tarot! But for now, if you'd like to check the project out you can visit the Fan Page or the website. If you'd like to use my images but aren't sure how or if you're allowed, please see my FAQ section here and look under 'image use'. I was recently contacted by Sarah from the Artists Corner and was asked if I'd be interested in doing an interview with them. This blog is really cool! They feature artwork from artists who also have their work licensed as tube images. There's all kinds of artists to learn about. You can check out my interview HERE! More original art for sale! More prints for sale! Other kinds of merchandise for sale! More giveaways! All of the above! Other!